Welcome to Sticky No More! STICKYNOMORE was born from a need to fix the beautiful luxury interiors that have suffered from the substandard coating that used on the interior parts of certain models. Because let's face it - These companies focus on speed and performance, not high quality interior trim. After seeing firsthand the sticky, gooey mess that the interior plastic coated parts eventually turn into, we had to do something. Buying new parts can be very expensive, and there is no guarantee that the parts will not become sticky again. 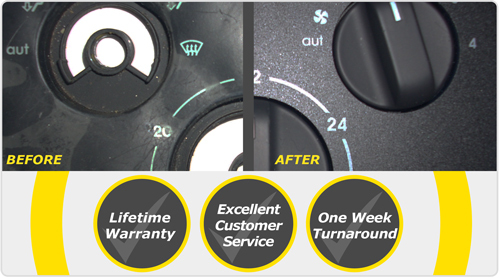 STICKYNOMORE offers a refinishing service that eliminates the need to buy new, expensive parts. STICKYNOMORE refinishes your existing parts to a standard that befits an exotic car. STICKYNOMORE is an industry-leading refinishing process completed by trained professionals to ensure flawless results. We don't ever sell a DIY refinishing solution and don't recommend DIY products. If you have questions, please Contact Us. For pricing, please use the pricing box to the right of this page. We have worked on parts for many different vehicles to include Ferrari, Maserati, Lamborghini, Alfa Romeo, Porsche, Aston Martin, BMW, Mercedes Benz, etc. Our work is not limited to those models, please send us an email for your specific vehicle needs. If you are experiencing any issues with interior parts in these makes just send us an email and we will gladly help in any way we can. Create your own high-quality removal instructions and we'll discount your next order. Learn More. I can not recommend your work more highly, and I consider myself to be extremely picky. The refinish quality, surface texture and color-match are perfect. Considering that these are very expensive to replace, highly visible parts, your refinishing costs are beyond reasonable. I can't thank you enough for my "new" interior. Scott A. Whitaker, M.D., Ph.D., J.D.